From 1943 until the collapse of the Nazi regime, Traudl Junge was one of Adolf Hitlers private secretaries. She worked for the Führer in his headquarters in the Wolfsschanze, in Berghof on Obersalzberg and on the special train in Berlin. 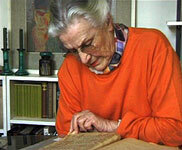 In 1944 she witnessed Stauffenbergs abortive assassination attempt and experienced the last days of the war and Hitlers suicide in the Führers bunker in the surrounded capital. And it was Traudl Junge to whom Hitler dictated his last will and testament. In Im toten Winkel, Traudl Junge speaks publicly about her life and her memories, about distress and self-reflection. She talks about her childhood in Munich, the coincidences and conditions of her life which led her first of all to the Führers chancery in Berlin, and later to the Wolfsschanze as his private secretary, about the daily routines among the inner circle surrounding Hitler, about everyday processes, the friendly banality of which constitutes an absurd contradiction to the NS regimes policy of extermination. When Traudl Junge tells of the last days in Hitlers bunker  a 45-minüte monologue without any cuts in the film  the picture which emerges is almost frightening in its force of impression and presence because it shows the emptiness at the centre of an inhuman power imploding in the face of defeat. Im toten Winkel does without any embellishments and concentrates wholly on the narrator: the intense and extreme compression of decades of unreserved reflection on history, repression, responsibility and guilt. The film refuses to take any speculative interest in the person of Hitler. It does not disappoint the desire for sensation: it refutes it. Having become a fierce opponent of National Socialism after the war, Traudl Junge was not able to pardon her naiveté, ignorance and error of the past. The question of her own responsibility is not a purely academic one, but rather becomes something that is alive and can be experienced in the protagonists unsparing and grave narrative, in her gestures and facial expressions, in the side issues through which the main subject emerges directly. In its bareness, deliberately designed for the cinema screen, Im toten Winkel is a film to be watched and heard and is spectacular without using any special effects. DV/FAZ35 mm, 1:1:37, Dolby digital, 90 mins. ORF, ARD, DRS, VRT, SVT, NPS, NRK, France 5, Brazil, Greece, Denmark, Finland, Italy, etc.